Last week our son Ben called the house wanting to know if we wanted to Skype. We usually call him every Sunday to find out how he’s doing so whenever he contacts us it’s a big surprise. His primary reason for calling was to share with us how hard he was studying for his math final exam. He ended up having three hours to complete 10 problems and it was a brutal test. Ben flew home yesterday afternoon and will probably sleep until noon today. I’m mentioning my son, who is a sophomore at Beloit College, because it’s providing me with an excuse to share a fascinating story that I stumbled across last week in Time Magazine about the study habits of South Korean students. In South Korea, students treat every day as if they were cramming for finals. One student was quoted in the story as saying, “All we do is study, except when we sleep.” The typical student begins classes at 8 am. and stops between 10 p.m. and 1 a.m.
Seventy four percent of all South Korean students participate in private after-school instruction. In South Korea there are more private tutors than their school teachers and the most popular ones make millions of dollars of year in online and in-person classes. Cramming is an entrenched tradition in Asia where typically grades and test scores are what counts to succeed professionally. This story reminded me of an article I read several years ago in The New York Times about South Koreans’ desire to get into Ivy League institutions. It highlights residential academies whose focus is to get students into top American universities. Their days begin at 6 a.m. and for some they don’t end until 2 a.m. when the dorm lights are turned off. President Obama has talked longingly about the South Korean educational system and the South Koreans have talked about Americanizing their system. 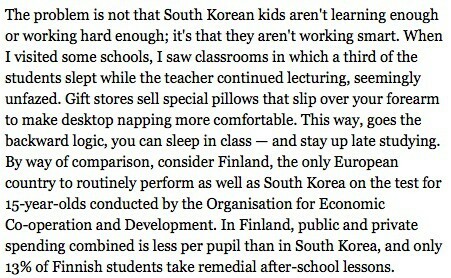 Too bad we couldn’t combine the American and South Korean systems of education. Now that would be impressive. In the meantime, if you child complains about his or her exam schedule, pull out this post. Lynn O’Shaughnessy is the author of a workBook, Shrinking the Cost of College: Great Ways to Cut the Cost of a Bachelor’s Degree. She also writes a college blog for CBSMoneyWatch. Follow her on Twitter.